Yesterday, the National Disability Rights Network, National Association of the Deaf, National Council on Independent Living, National Federation of the Blind, VetsFirst/United Spinal Association and other disability organizations met with the U.S. Department of Justice, Civil Rights Division, Voting Section. Discussions included the Department’s plan and process for ensuring that all voters with any type of disability can cast a private and independent ballot on November 6. The following Press Release outlines DOJ’s Election-Day Plan. In anticipation of the upcoming election, the Justice Department today provided information about its efforts, through the Civil Rights and Criminal Divisions, to ensure that all qualified voters have the opportunity to cast their ballots and have their votes counted free of discrimination, intimidation or fraud in the election process. The Civil Rights Division is responsible for ensuring compliance with the civil provisions of federal laws that protect the right to vote, and with federal criminal laws prohibiting discriminatory interference with that right. require states to ensure that citizens can register at drivers’ license offices, public assistance offices, other state agencies and through the mail; and include requirements regarding maintaining voter registration lists. The Civil Rights Division’s Criminal Section enforces federal criminal statutes that prohibit voter intimidation and suppression based on race, color, national origin or religion. Shortly before the election, the Civil Rights Division will announce which jurisdictions will have federal personnel as election monitors and observers at polling places. Civil Rights Division attorneys in both the Voting and Criminal Sections in Washington, D.C., will be ready to receive election-related complaints of potential violations relating to any of the statutes the Civil Rights Division enforces. Attorneys in the division will take appropriate action and will consult and coordinate with local U.S. Attorneys’ Offices and with other entities within the Department of Justice concerning these complaints before, during, and after Election Day, as appropriate. Civil Rights Division staff will be available by phone to receive complaints related to ballot access (1-800-253-3931 toll free or 202-307-2767) or by TTY (1-877-267-8971). In addition, individuals may also report complaints, problems, or concerns related to voting by fax to 202-307-3961, by email to voting.section@usdoj.gov and, closer to Election Day, by complaint forms that may be submitted through a link on the department’s website. Complaints related to violence or threats of violence at a polling place should, in the first instance, always be reported to local police authorities by calling 911. The Department’s Criminal Division oversees the enforcement of federal laws that criminalize certain election fraud and vindicate the integrity of the federal election process. 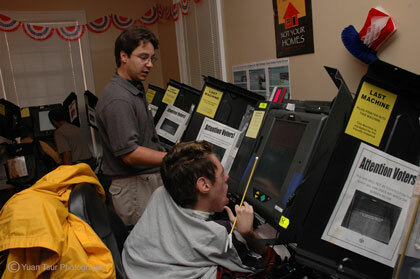 The Criminal Division’s Public Integrity Section and the Department’s 94 U.S. Attorneys’ Offices are responsible for enforcing the federal criminal laws that prohibit various forms of election fraud, such as vote buying, multiple voting, submission of fraudulent ballots or registrations, destruction of ballots or registrations, alteration of votes and malfeasance by election officials. The Criminal Division is also responsible for enforcing federal criminal law prohibiting voter intimidation that does not involve a basis in race, color, national origin or religion (as noted above, voter intimidation that has a basis in race, color, national origin or religion is addressed by the Civil Rights Division). The department encourages each U.S. Attorney’s Office to communicate with state election officials before the federal general elections regarding the handling of election-related matters in their respective districts. In addition, the department provides annual training for the Assistant U.S. Attorneys who serve as district election officers (DEOs) in their respective districts. DEOs are responsible for overseeing potential election-crime matters in their districts, and for coordinating with the department’s election-crime experts in Washington, D.C.
Federal prosecutors at the Public Integrity Section, the DEOs in U.S. Attorneys’ Offices, FBI officials at headquarters in Washington, D.C., and FBI Special Agents serving as Election Crime Coordinators in the FBI’s 56 field offices will be on duty while polls are open, to receive complaints from the public. Election fraud or intimidation complaints should first be directed to the local U.S. Attorney’s Office or the local FBI office. A list of U.S. Attorneys’ Offices and their telephone numbers can be found at www.justice.gov/usao/offices/index.html, and a list of FBI offices and accompanying telephone numbers can be found at the “Contact Us” button at http://www.fbi.gov. Again, however, complaints related to violence or threats of violence at a polling place should, in the first instance, be reported to local police authorities by calling 911. Election fraud or intimidation complaints may also be directed to the Public Integrity Section (202-514-1412). Public Integrity Section prosecutors are available to consult and coordinate with the U.S. Attorneys’ Offices and FBI regarding the handling of election-crime allegations. Both protecting the right to vote and combating election fraud are essential to maintaining the confidence of all Americans in our democratic system of government. We encourage anyone who has information suggesting voting discrimination or ballot fraud to contact the appropriate authorities.